How many of you are like me and have a resolution to lose weight and live a healthier lifestyle in 2014? Now, let’s be honest, how many of you made this same resolution in 2013, 2012, 2011, etc? Finding a program that you can stick with and find success can be challenging. Well, I’ve got some great news for you! Nutrisystem, a leading provider of home-delivered weight loss meal plans for over 40 years, has a all new program: Nutrisystem My Way ! Okay, you’re probably saying, “It’s a new diet plan, so what? What makes this one different?” Well, I’m so glad you asked. The Nutrisystem My Way program uses a scientific algorithm to estimate each customer’s metabolic rate to create customized meal and exercise plans to maximize healthy weight loss, burn fat efficiently and boost fat metabolism. Sounds great, right? But that’s not all! 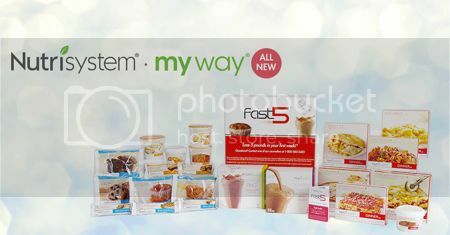 The Nutrisystem My Way also includes the Nutrisystem Fast 5! The Nutrisystem Fast 5 is a one week program filled with tools to help you jump start your weight loss program. This program includes EnergiZING Shakes that are filled with B Vitamins, Green Tea, Caffeine along with Calcium and Vitamin D to rev metabolism. The Craving Crusher Shakes include protein and fiber along with essential nutrients and antioxidants to help curb dieting pitfalls like the “afternoon vending machine snack”. The Nutrisystem Fast 5 also includes 7 breakfasts, lunches and dinners designed to maximize your weight loss…although results may vary, you are guaranteed to lose at least 5 pounds during the first week. Once you’ve completed the Nutrisystem Fast 5 week (the first week), you will then begin your personalized Nutrisystem My Way plan. Also, I am super psyched to announce that Nutrisystem has an exciting offer going on right now! When you purchase a 28 day Nutrisystem My Way plan, you will receive the Nutrisystem Fast 5 for FREE! Also, if you are not completely satisfied, within 14 days of receiving your first order, just give Nutrisystem a call to return the remaining food and receive a full refund and return shipping (only available on your initial order). So what are you waiting for? Call Nutrisystem today for a healthier 2014!